As a small business owner, you handle the majority of your company’s operations. From greeting new customers or clients to organizing employee schedules, it seems as though there is rarely enough time to do more than balance the books. While everything you do is important, streamlining your business’s financial strategies is critical for your peace of mind and the company’s success. As you assess the financial situation this quarter, use these 10 tips to clean up your current strategies. Before you can make changes, it is important to take an honest look at your current financial situation to determine what is going well and what is bad. Begin by comparing your current debts and spending habits to your income flow. This allows you to see areas where your income could be better spent reinvesting in your business rather than paying interest on debt. All of that paperwork piling up in your file cabinets and desk is depressing, and it is also hard to read what is going on. Instead, scan your documents into your computer so that you can stop wasting time searching through file bins or trying to ready tiny print. Once you have your records digitally stored, it will also be easier to do things such as upload documents when you are doing your taxes. The creative insight that led you to be a business owner often means that your time is better spent developing marketing strategies for your company rather than adding up expense reports. If you do not have an accountant, then consider hiring one. They usually pay for themselves by showing you where your company could trim the fat so that your profits increase over the next year. As an employer, insurance is one of those expenses that is well worth it if something ever happens. However, it is easy to get stuck paying too much if you never seek new quotes. Many insurance companies offer lower rates to new customers, so give your current policy a check to know what you are getting. Then, call around to see who will give you better rates. You may get more coverage for a lower price, which is a win for boosting your company assets. Few things are more embarrassing as a business owner than writing a check to an employee or lender that bounces. Yet, it is common to have multiple checks floating around out there when people take their time to cash them in. Balancing your checkbook may not be the most exciting thing to do, but it pays off when you know exactly where you stand financially. The time to pay your quarterly taxes often comes faster than you expect. Check the date on your calendar, and see if it is time to prepare your reports. Then, double check that all of your quarterly taxes are paid up. Having to pay penalties cuts into your overall profits, and it is absolutely unnecessary when you stay on top of your responsibilities. You prioritize the things that you see on your calendar, and your accounting tasks should be right there next to your kids’ birthdays and that monthly meeting with your mentor. Sit down, and make a list of important dates that affect your finances. Then, add in a weekly day to sit down, and do the mundane activities such as balancing the checkbook. Then, put them on your calendar so that you will see with a glance what should be done next. When you run a business that extends credit or allows payment plans, it is common to have a few accounts that run late. While no one likes to send someone’s account to collections, this is an unfortunate, but important, part of your business operations. If you find accounts that are more than 90 days behind, then your odds of recovering the loss go up if you address it right away. As your business grows or struggles, changes must be made to your contracts. Know when your contracts expire, and make sure to bring them out for review. You may discover that the salaries you are paying your sales team no longer fit their duties. Alternatively, you may be able to get a better deal on your supply delivery service such as a discount for paying up front. Either way, its worth checking to see what can be changed. As you delve deeper into your business’s financial situation, you will identify areas that you want to improve. Set goals for the upcoming quarter or year that take you closer to hitting your mark. Make sure to include a mix of basic ones such as sitting down once a week to review the current reports and longer ones such as reducing major expenses. Working on the books may not be the most exciting part of owning a business, but it is one of the most important. 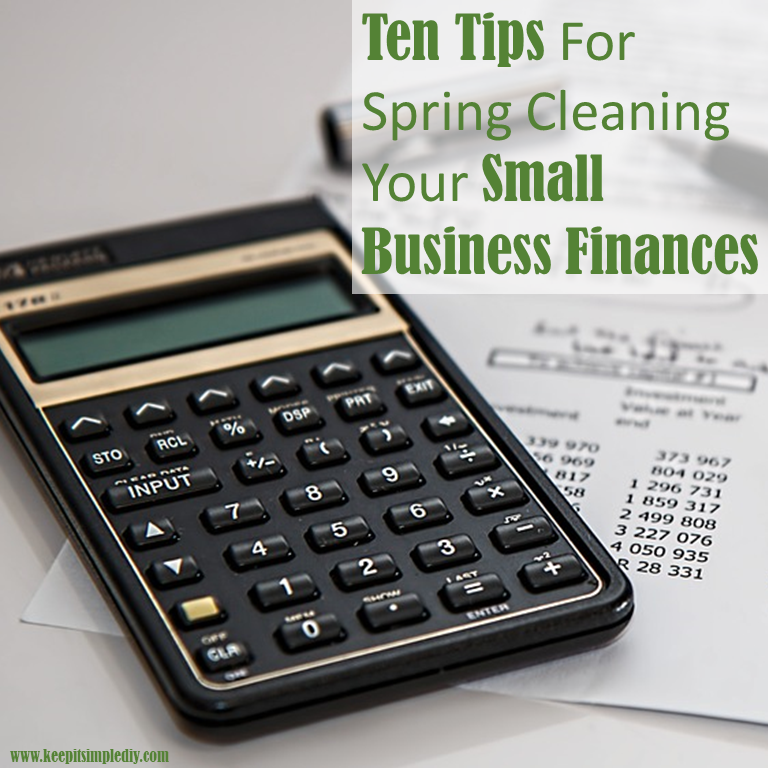 By doing a little spring cleaning now, you will clear out the dirt so that you can see a brighter financial future.